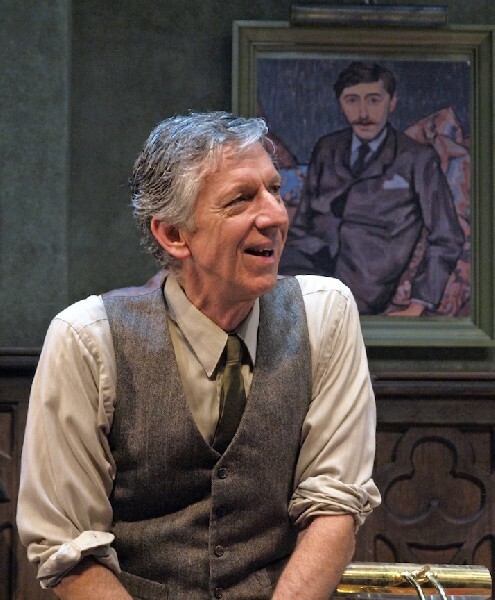 Frank (Geoffrey Wade) with a portrait of E.M. Forster in the background. In the United States we like to think that the class that a person is born into does not determine his fate, that all men are created equal. But it is becoming increasingly obvious that class is a strong, almost inescapable determinate of fate in this country. Wealthy children receive the best education and the good jobs go to the best educated. The wealthy inhabit a world of choices. The poor, who receive a substandard education, have few choices and little chance of rising out of the class into which they were born. Educating Rita disguises a thoughtful and nuanced exploration of class, choice, and the role of education, as a diverting entertainment. Rita, a Liverpool hairdresser, played with a winning brightness and energy by Sarah Manton, wonders, "Is this the absolute maximum I can expect from this life?" She is stifled by her lack of choices, by the conversations surrounding her that are limited to dresses and music, and by the expectations of her husband and family. Though her friends don't understand and her husband objects, she is determined to get more out of life and enrolls as a student in Open University. Frank, a scotch-loving, self-described failed poet, who has agreed to take on an Open University student for the extra income, reluctantly becomes Rita's tutor. Geoffrey Wade is a charmingly cynical Frank who, despite his disillusionment with students, has a passion for poetry and a latent gift for teaching that emerges time after time as he introduces Rita to the literature he loves, notably including the novels of E. M. Forster, whose work explored the boundaries of class and the pursuit of personal connections across class. The talkative Rita's directness and irrepressible nature attract, charm, and frustrate her teacher as she progresses through the course. He is taken with her unspoiled interpretations, which make him revisit his own, but if she is to pass her exams, as she is determined to do, he tells her she must answer the questions as expected. He explains that "it's an accepted ritual, with rules. And you must observe the rules supported with quotes from accepted authorities." As in life, for everything that is gained, something is lost. As Rita changes, so does her life. Her marriage, friendship, and work are all left behind, as she gains the ability to navigate a more sophisticated world. Even her reliance on her teacher wanes and her vibrant native understanding of the poetry is altered by her new knowledge. Is it dulled or enhanced? That is a question that nags at Frank, but again as in life, is left unanswered. In the end, when she sits for her exams, Rita is confronted with a choice, to answer a question with her instinctive and well-reasoned answer or by the rules, "supported with quotes from accepted authorities." You'll have to go see this marvelous, funny production to learn her response, but what truly matters to Rita, is that finally she has a choice. Ms. Manton is a thoroughly engaging Rita, though at times her heavy Liverpool accent, coupled with her appropriately rapid delivery of lines, obscures some words and phrases. 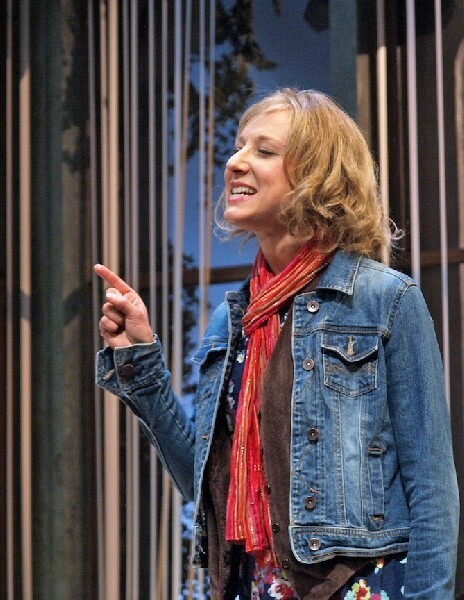 Rita's gradual metamorphosis throughout the play is just right and is smartly mirrored by the subtle changes in her wardrobe, thanks to costume designer, Kirche Leigh Zeile. Geoffrey Wade is believable and sympathetic as Frank whose performance especially shines when he is teaching Rita a new concept or helping her to recognize her own discoveries. The congruity of the overall production including the flow and depth of the performances, set and costume design, and lighting and sound must be attributed to its director, Malcolm Ewen, but it is so seamless as to be invisible, which is a rare and admirable accomplishment. Of special note is the one-room set, designed by Russell Parkman, which is a careful and subtle clash of class. Frank's office, with its large window and intricately carved wooden moldings is obviously located in an upper class building, but the generic metal desk, vertical blinds, and large hanging fluorescent lights that furnish it are fixtures from the working class world. The inclusion of a prominently placed portrait of E.M Forster completes the reference. Don't miss the opportunity to see this world-class production in the Weston's intimate theater where you are close enough to see every nuance of these fine performances.